In forests of California’s Central Coast, how does resprouting confer competitive advantages for tanoaks and redwoods after fire? 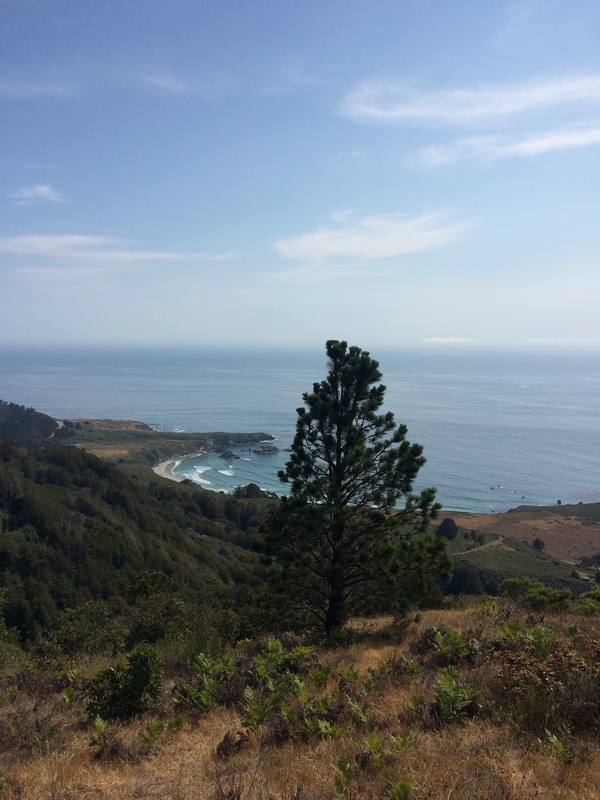 The Central Coast of California is an understudied, fire-prone system dominated by redwoods (Sequoia sempervirens) and tanoaks (Notholithocarpus densiflorus). These fire-adapted trees are able to sexually regenerate through seed, as well as asexually regenerate through resprouting from a storage organ at the root crown, called the lignotuber. Competitive advantages to life-history strategies, such as sexual vs. asexual regeneration, change as disturbance frequency and intensity change. Potential, future alterations in spatiotemporal distributions of reproductive strategies may play a large part in determining future forest stand structure. This project asks the question: In a post-fire landscape, is resprouting or germinating from seed more advantageous? To answer this question, seedlings and saplings of redwood and tanoaks were collected in the Santa Lucia Mountains of the California Central Coast. The study area was burned in 2008 in the Basin Complex Fire. Above and below ground ages were determined by counting annual rings. Results indicate that resprouting is more advantageous than regenerating from seed due to more rapid aboveground biomass accumulation post-fire and faster growth to taller heights. Seedlings with larger lignotubers, thus older belowground, enable faster resprouting. A spectacular view of where Sofia conducted her research. 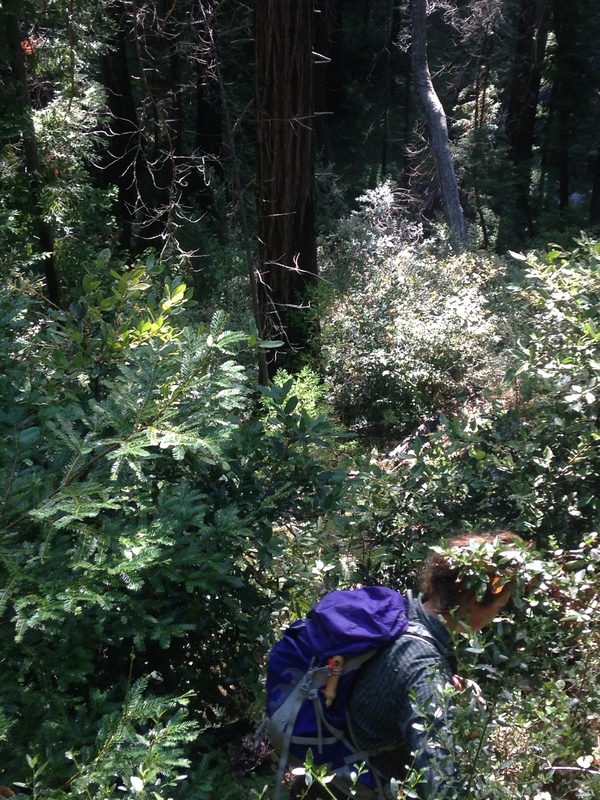 Sofia often spent long hours in the field, collecting seedlings and saplings of redwood and tanoaks in the Santa Lucia Mountains of the California Central Coast. 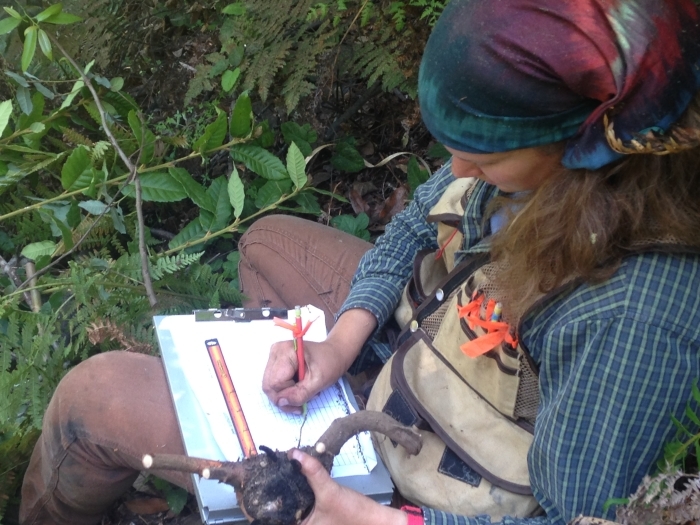 Sofia and Allison Simler, a Ph.D. candidate at UC Davis, traverse the tangles of redwood-tanoak dominated forests.